'Sound is like a dream, fleeting and difficult to remember and describe. 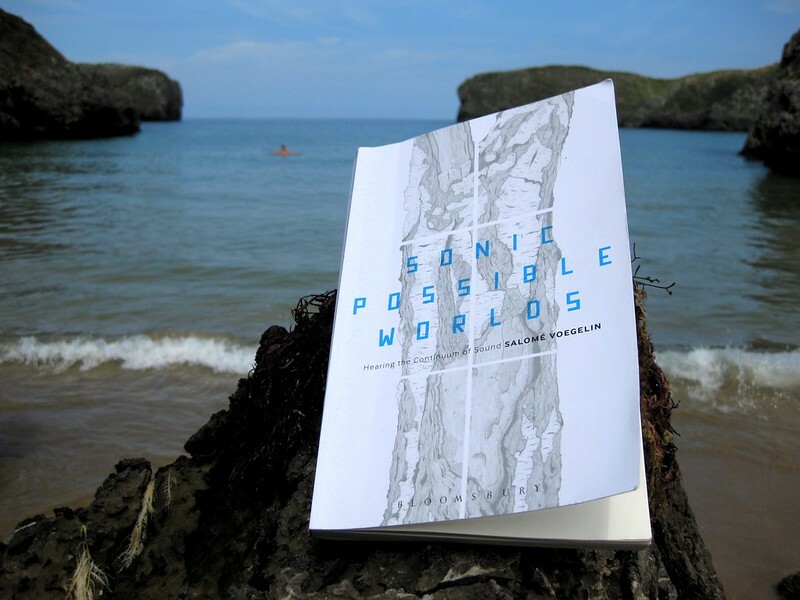 Sonic Possible Worlds is a grand tour through the depths of ways of listening and responding' - Pauline Oliveros, Deep Listening Institute. The evening began with readings by the Salomé, followed by a conversation with Angus Carlyle, around the possibilities opened by Sonic Possible Worlds for field recording and sound art; for a politics of listening and for the sound of unicorns. Then there were responses to the book from Daniela Cascella, and myself, with a drinks reception afterwards. The central thesis of Sonic Possible Worlds, is that at present traditional musical compositions and contemporary sonic outputs are approached through separate and distinct critical languages and histories. As a consequence, no continuous and comparative study of the fields are possible. In Sonic Possible Worlds, Salome proposes a new analytical framework to investigate works across genres and times. Hello, can you hear me OK? Salomé suggested, given my interests, that I might like to think-through the last chapter. I guess it's the section that expands the possibilities, of these sonic possible worlds you've been hearing so much about this evening. I have to confess that these are not my worlds, these worlds of attentive listening, …........I'm definitely not equipped. lets call it , futurity . When we try and listen beyond this ‘near future’ we enter an unmapped, or an unlistened to zone. A zone full of uncertainty. Salomé's "possible impossible"
is often (by default?) terrifying, unknowable and filled with anxiety. Angus asked earlier: where's the malign, where's the malicious in listening? is that we operate in a very shallow timeframe. I'm tempted to say, a narrow frequency. In the UK at least, organizations (at whatever scale) are scrabbling for resources. They are working on aggregating resources for the next exhibition, or the one after that, …...... or the next semester, etc. And, after the exhibition (or semester) is over, they are quickly forgotten as we scrabble towards the next one. Few organisations have credible archives. Any aspirations or plans they might have, any scenarios - are three or five year business, financial or operational plans. So I have the feeling we imagine the future, the 'possible impossible' as something done to, or for us, by others. Rather than something we can make together. Of course, the future remains unwritten. I think it's a bit harsh on curators. And I (generally) have less faith in artists than Salomé, because most are comfortable with tweaking the known. In this call for a politics of listening, (the will, and wherewithal) …........ I sense this lack as (an unheard?) political economy. An (impossible?) sonic political economy produced by new relations - like listening through a continuum- , new networks and new institutions. OBVIOUSLY – when I say institutions. But institutions (in the ancient sense of the word) to reproduce the values we value. More like institutions of care. and to produce them collectively. and what we do not. And one of the things I heard while reading, was the sound of construction.